During cataract surgery, your eye’s natural lens, which has become cloudy, is removed and replaced with a permanent artificial lens implant called an intraocular lens (IOL). IOLs are made of a flexible, foldable plastic about one-third of the size of a dime. Recent advances in IOL technology have brought about many new styles of lens implants. It is important to discuss with your doctor what your specific visual goals are following cataract surgery so that the appropriate IOL will be selected for your surgery. The two broad categories of IOLs now available are monofocal and multifocal lens implants. Monofocal implants provide a single focus when you are not wearing glasses. Depending upon the lens power selected by the eye surgeon, the eye may see best at either far, near, or intermediate (midrange) distance when eyeglasses are not worn. 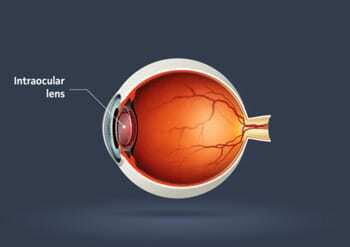 Most people who have cataract surgery with a monofocal IOL choose to have a lens that provides good distance vision without eyeglasses. With a monofocal IOL set for distance, you will need to have reading glasses for close-up vision. Conversely, if you choose to have a monofocal IOL set for near vision, allowing you to read without eyeglasses, then you will need eyeglasses to see clearly in the distance. With a monofocal lens and the appropriate bifocal (or trifocal) eyeglasses, you can expect to see well at all distances. More information about monofocal lenses can be viewed at www.tecnisiol.com. A specialty variation of the monofocal lens, called a toric lens, has recently been developed for patience with moderate to high astigmatism (a football-shaped cornea). While mild astigmatism can be treated at the time of surgery by making extra tiny incisions in the peripheral cornea called limbal relaxing incisions, larger amounts of astigmatism are better treated with toric lenses to provide clear vision at a single distance without glasses. More information about toric lenses can be viewed at www.acrysofiqtoric.com. Multifocal (and accommodative) lens implants were developed to make patients less dependent on eyeglasses for both near and distance vision after cataract surgery. Multifocal lenses use specially designed focal zones on the surface of the lens. Light rays are focused through the different zones to provide sharply-focused images at both near and distance. The ability to read without eyeglasses and the reading distance can vary because of individual factors, but is generally best when the multifocal lens implant is placed in both eyes. More information about multifocal lenses can be viewed at www.tecnismultifocal.com, www.rezoomiol.com, and www.acrysofrestor.com. Accommodative lens implants are flexible implants that move slightly with contraction of the natural focusing muscles of the eye to focus clearly at different distances without eyeglasses. These typically reduce, but will not eliminate entirely, the need for eyeglasses. An additional strategy to give clear vision both at near and far without glasses is called monovision. This technique uses traditional monofocal IOLs to allow for near or intermediate vision in one eye and distance vision in the other eye. Not everyone is comfortable with this difference in focus, but many people find they adapt well to monovision when they try it out first using contact lenses before having cataract surgery. Your ophthalmologist can discuss with you the pros and cons of the many different lens implants available and different strategies to reach your desired visual goals following cataract surgery.